San Pedro de Atacama is a town in Northern Chile that is a popular with both domestic and international travelers. Visitors use the town as a starting point to explore the area's impressive landscapes. 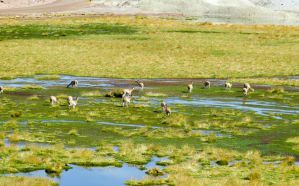 Most of the area's most interesting attractions are found in Los Flamencos National Reserve, which is one of Chile's most diverse national parks. 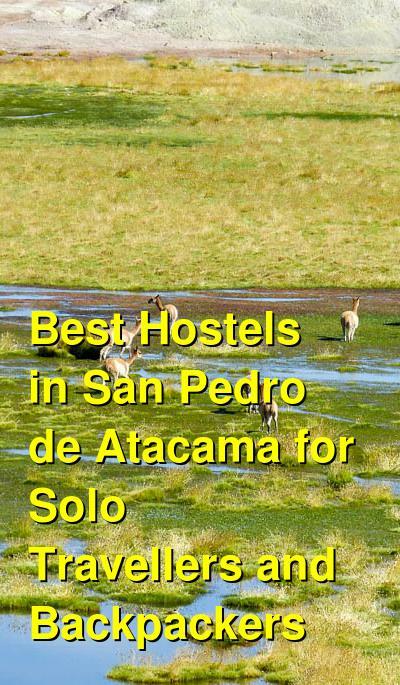 As a popular tourist destination, there are many decent hotels and hostels around San Pedro de Atacama. Some are quite overpriced and the quality can vary, so read reviews before making reservations. How much do hostels in San Pedro de Atacama cost? A good hostel for backpackers, solo travellers, and small groups. Hostal Rural is one of the most popular hostels in San Pedro de Atacama. It has the quintessential backpacker's hostel atmosphere and it's a great place to relax and meet other travelers from around the world. The hostel has a fully equipped kitchen which guests can use as well as a fire place, comfortable hammocks, and many places where you can simply hang out. It really starts to feel like your home away from home. In the evenings after a busy day exploring the area, you can return back and hang out around the fire pit. Guests enjoy swapping travel stories and talking about their plans for the coming days. You're sure to leave here with a few new friends. The staff is also wonderful, and they can give you all kinds of advice about the best places in the area to visit. They can also recommend tour companies in the area where you can book affordable and quality tours. The hostel has a family like atmosphere and is a good option for backpackers and solo travelers who want to meet others. There are dorms that sleep four or six people and the rooms are kept clean. La Casa De Matilde is a great option for backpackers and budget travelers who want a fun and comfortable environment. It's located about 200 meters from the bus terminal and is about five minutes from the center of town where you'll find the main square, church, museum, and the main street. The hostel is small, with just four rooms. There is a double room, two four private rooms, and a four bed co-ed dorm. Each room has it's own private bathroom. The hostel also has a guest kitchen which guests can use to prepare their own meals. This hostel has a family atmosphere and you'll feel like you're really staying in an authentic part of Chile. The hostel is clean and well designed and you're sure to have an excellent stay here. A good hostel for solo travellers, couples, small groups, and backpackers. Mamatierra Hostel is another favorite place to stay in San Pedro de Atacama. It has a friendly and social atmosphere and there are several great places where guests can hang out. There's a nice outdoor area where you can enjoy the sun and meet other travelers. Guests have access to a barbecue and a shared kitchen which they can use to prepare their own meals. There's also a television room if you want to relax inside. Free wi-fi is available throughout the hostel and a complimentary breakfast is also included in the price of the room. The hostel has its own tour desk and they can help you arrange any tours excursions of the area. They offer tours at reasonable prices and they work with a variety of companies around town. The hostel has a wide variety of private rooms available including twins, doubles, and three bed rooms. There are also four and five bed dorms.